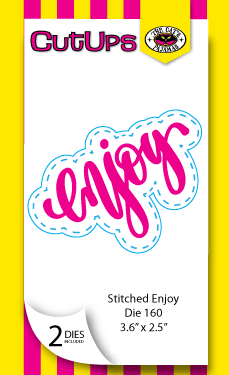 Today's featured product is the Stitched Enjoy Cutups. In the beautiful scripty style of the previously released Stitched Beautiful Cutups, this die is so versatile. 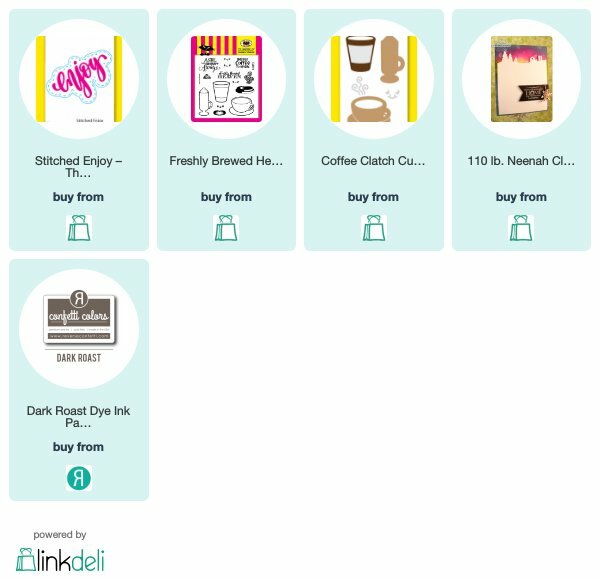 It's probably no surprise that when I thought about the word enjoy, coffee came to mind, so I've paired it with the Coffee Clatch CutUps that will be peeked soon. 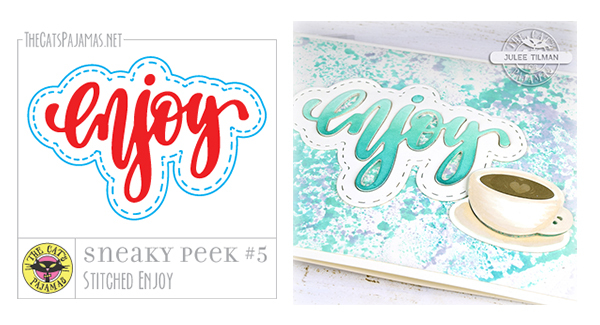 I started with the Stitched Enjoy Die, cutting it from classic crest cardstock as it comes from the package. I then snipped the dies apart and cut just the enjoy two more times, one from cardstock that I had sponged with aqua inks, then I layered them all together to make the enjoy portion really stand out and inlaid into the stitched frame. Next I cut the cup and saucer from Coffee Clatch from cardstock and colored with Copic markers. I used the little latte art stamp from Freshly Brewed Heaven to stamp the coffee portion (the only stamping on the card). The die for this cup is really cool and cuts the bottom of the cup, but leaves it attached to the saucer. Here I added a bit of foam tape behind the cup, but not the saucer and it added just the right bit of dimension. Next I got to work on my background. The background is done by smooshing wisteria wonder, pool party, coastal cabana and bermuda bay inks onto cardstock. 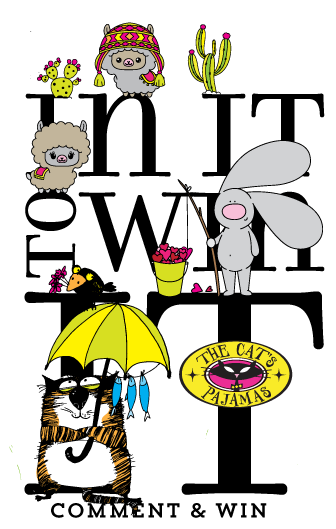 And finally it was time to layer it all together and drink another cuppa! Great card!! Love your choice of colors for the background!! This die is so cute! I love everything about this card! Great job. Pretty colors in your background, Julee. And a lovely card. Great card, love the background! Great sentiment to go with this cup of coffee. Wonderful card, Julee! Great background and lovely die. I always enjoy sharing a cuppa with you.